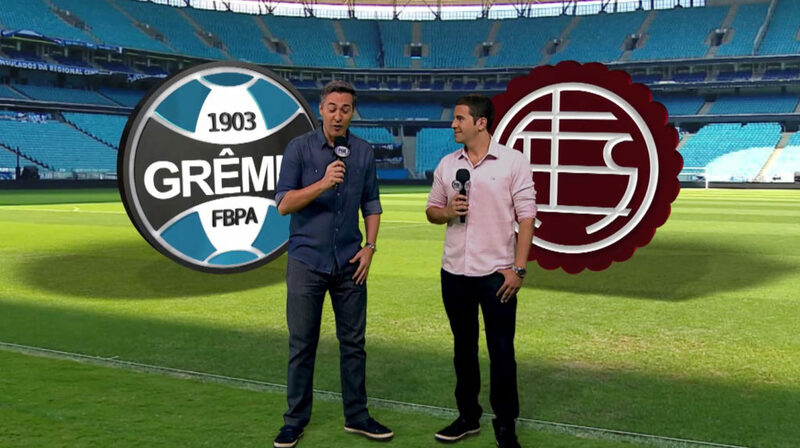 Fox Brazil, the 24-hour subscription sports channel from 21st Century Fox, recently used InfinitySet from Brainstorm to provide a unique angle to its Copa Libertadores soccer (football) coverage. Through InfinitySet’s TeleTransport feature, the network was able to send talent live to the match pitch while actually broadcasting from the network’s studios, creating an on-site report for the audience. “Fox is proud of being an innovative and creative channel, and this coverage of the Copa Libertadores proves once again our commitment with the most advanced technology. That is why we have chosen Brainstorm’s InfinitySet advanced TeleTransporter features to enhance our live shows getting the best of our resources at any time,” said Luis Santos of Fox Sports. Example of InfinitySet’s TeleTransporter output. The TeleTransporter technology, exclusive to Brainstorm, combines 3D virtual sets with real characters and live or pre-recorded video feeds, all moving accordingly with precise matching of perspective, color, shadows, reflections or focus, notes a release from Brainstorm. “We are absolutely pleased with the results obtained by FOX using our technology, which really provides new ways to tell a story with greater flexibility. To achieve this, Brainstorm also counted with the support from EXEC TEchnology, the company’s appointed reseller for Brazil”, said Borja Chirivella of Brainstorm. Additionally, Fox Brazil extensively used augmented reality technology from Brainstorm on set, with full perspective and accuracy, showing different 3D elements including the football clubs’ badges and also social media content and other graphics.